Remember the emphasis on so called ‘New Age Shifts’, from around 2012? When I was still a Spiritualist, I was taught the New Age plans to recruit many globally. In those days, I fully agreed with their plans. Now, I’m aware of the truth behind it all! As a supernatural whistleblower, I reveal inside secrets from top spiritual leaders. See image for famous quote from Top New Ager & Luciferian Medium, David Spangler’s famous; read his books if you don’t believe me. Benjamine Creme, Barbara Marx Hubbard and other famous Luciferian Mediums have shared similar quotes. They wrote in books and teach that in The Last Days, those who refuse to accept Lucifer and the New Age global religion will be killed, by various methods, including being removed by Spirit Guides, Light Beings, Alien Abduction, etc! They say Christians won’t be raptured by Jesus, but just removed so that Lucifer can reign. (Christians know aliens, guides, light beings, etc, are demons of course). You may suspect this is a conspiracy theory, so please use your critical thinking skills. Research online for hard evidence for my claims! What was the significance of the ‘shift’? Recruiting many to mindsets that favour New World Order philosophies globally. In this tv interview, I was delighted to talk with Doug and Michael on this topic. I believe it’s the most significant interview I’ve ever spoken on. When I ask Doug and Michael if we could do this show, Doug asked me to go ahead and research it all. That’s why I have a pile of notes with me! I was so blessed that he asked me to script the show, including the questions that he was to give to Michael and I. It was the first time I had done that. Sadly, at the time, we didn’t realise it was the last time we’d meet. Doug went to be with the Lord in May 2013 and I miss him greatly. In the show we mention some key facts that most folks aren’t aware of. Top famous Mediums admit they believe that Lucifer is the god of the New Age Movement and Spiritualism, that supernatural powers come from him, etc. From the 12th-21st December 2012 through 2013, masses deliberately meditated globally, in an attempt to usher in Luciferianism and cause a ‘spiritual collective shift’. They believed a positive shift would occur, but many were disapointed it did not occur. Many who realised their ‘SPIRIT GUIDES’ had lied to them about this, actually came to Jesus, realising their spirit guides were demons! (A few of these folks I know personally and they have shared their True Stories on my blog). But those who still believe in the New Age remain vigilant at urging others to join the New Age or Occult. Their motives are mostly good, as they truly believe this is good. The aim is to increase Lucifer’s light, they don’t know it’s actually false/demonic ‘light.’ Not all of them are aware this leads to further unfolding of the New World Order, and uniting of all faiths, including Christianity to the One World Religion … led under the anti-christ. Only Christians who really know their bibles, will not be deceived by this. World leaders who are famous Christians will also preach this is the way to go, and millions will follow, not realising those leaders have fallen away from the faith, to follow doctrines of demons. We discussed Luciferianism within Spiritualism and New Age Movements. Famous Mediums and self confessed Luciferians, felt Lucifer is god – Madam Blavatsky, (‘Mother of The New Age Movement’), and famous Medium Alice Bailey, founded Theosophy in 1830’s and it still influences the New Age, Spiritualism, FreeMasonry, Illuminati, etc, today. 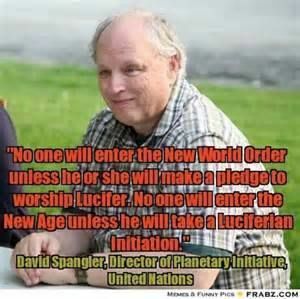 It aims to aid Lucifer in bringing his ‘light and peace’ via NWO, One World Religion and Govt, etc. When I was a New Age Spiritualist, I believed their teachings. We were taught that in the future, there will be a global cleansing, such that anyone who does not accept New Age, and does not take the Luciferian Initiation and say the Luciferian Invocation, will have a choice. Do it or die! They taught that some, but not all, from fundamentalist religions Christian, Jews and some others, will refuse to accept Lucifer and thus be killed. Because they feel we produce negative vibrations, thus holding back his return, by not submitting to him. They taught that those people will be killed by various methods, some natural disasters or illness, others will be removed by aliens, or Spirit Guides! Those left on earth, who have joined the New Age and accepted Lucifer as god, will be saved by the aliens and Spirit Guides. They say that once the Christians have vanished or died, some will say that Jesus came for them in the Rapture. But they will teach Jesus did not return, it was aliens who killed us. (I think that many of us will indeed be killed by demonic aliens, the Bible does say in the Last Days, there will be demons released from the Abyss. See verses in the book of Revelation, about swarms of locusts (metaphor for demonic hordes). It does teach their will be martyrdom of Christians, beheadings, etc). You can still see on some New Age websites today, many Mediums who still teach this, eg, Barbara Max Hubbard a, is very outspoken on it. If you find this hard to believe, you can research it online. For example, The Lucis Trust, formerly known as The Lucifer Trust, is based on Theosophy (which is Luciferian), and it’s the publishing arm of The United Nations. Remember the UN aims to be a peace keeping agency for the nations! I knew this when I was a New Ager. Lucifer promises world peace, but is a liar. No surprise then, that he is an influence in the UN. Few Christians would believe me years ago, but it’s all online now for you to check and test with scripture. (Theosophy – the name given to a global group of Theosophists. They accept New Age teachings that Lucifer is still an angel of light, and wants to bring us peace and that Jesus is not the Saviour. It aims to unite all faiths and religions to come together and receive global peace through their coming messiah type figure. Christians see this in the Bible, and recognise it to be a false messiah – the anti-christ. It’s main teachers were Luciferian Mediums, who received their teachings from demonic Spirit Guides, aliens, etc, who lied to them – Madam Helena Blavatsky, Alice Bailey & her husband Foster, a Free Mason. Current day leaders : Benjamin Creme, David Spangler and Barbara Max Hubbard). Again, please see the many articles in this blog, true stories by EX Mediums, etc, giving proof that such ‘spirits’ are liars. They are actually demons, just as the Bible describes and they masquerade as dead relatives or ascended spirit beings, to deceive the masses. So many Mediums have confronted their ‘Spirit Guides’ or ‘dead family’, in the Name of Jesus Christ, to reveal their true identity. Their mask has faded away, and their true demonic nature was revealed, screaming at the mention of Jesus’ mighty name. Mediums who watched me on TV, took my advice to do this. Later contacting me to say it was true, their ‘spirit friends’ screamed when challenged with the name of Christ. 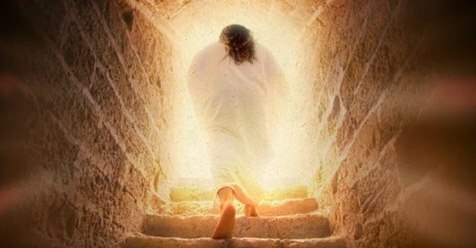 Thus they came to Christ and rejected those demonic ‘Spirit Guides.’ Please see this LINK about how to Test The Spirits. Please pray & research. Use your critical thinking skills. Find evidence from source material, original quotes from Mediums, etc. This isn’t mere conspiracy theories! Even many Christians still can’t see this yet. But it’s predicted in the bible. Do you think the Antichrist will just appear out of no-where? Many leaders have been awaiting him for decades, either as The Maitreya, or the antichrist and whether they believe in Lucifer, or actually know he is Satan. They have been setting the world stage up, getting everything in place. The Lucis Trust is indeed linked to the UN. Do the sums guys, it adds up. But the Good News is, Jesus knew all about this, it’s no surprise to Him and many souls will be saved in these last days; as millions more folk awake to the truth. Come Lord Jesus, come! These are clearly the last days, when we need to get closer to Jesus than ever before, get prepared and don’t fall into lukewarmness. For Christ will return for a pure and spotless bride. Hallelujah! 2 Responses to AntiChrist System Advancing Now – Laura shares on TV.